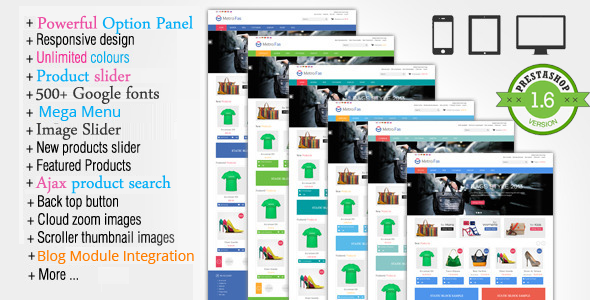 MetroFas Responsive PrestaShop Theme With Powerful Admin Options. The template is fully compatible with heavy stores which have a variety of languages. It’s designed to easily change color and background. Best fits for Cothing store, furniture store, watch store, digital store, hitech store, cosmetics shop, flower shop, perfume shop, fashion store, apparel store, fashion store, clother store and any Prestashop store if needed an easy customization template. We supply a full help with our products and after purchase – support to all our customers. If you are interested in our fully installation you can find detailed information on our documentation. It is clear, easy to customize Prestashop template. 100% Tableless design. 100% HTML/CSS/DIV compliance. Tutorial and detailed User guide for installation and using. Theme Layout, custom background and custom unlimited color Setting. Choose your theme font form 500+ google fonts. Upload your won Payment Icon with link. This theme supports Prestashop v1.6 as there are NO modifications in core files. You will get complete access to all future theme releases, updates and additional plugins. There are no additional fees – just a one-off payment for unlimited lifetime access. If you have any suggestion or need to improve any features in our theme, please let us via our profile page. We will list and highly try to improve those features in upcoming updates version. Note : The product images are for demonstration purposes only and are not included in the package. Thank you for purchasing one of our products, We really appreciate it! To get the best support possible please visit our support system. Emails, tweets and comments containing support question may be ignored, please use the support system. The Bigshop – WooCommerce WordPress Theme! We are a team of developers that create WordPress, WooCommerce, PrestaShop, OpenCart, CS-Cart themes and provide dedicated support to our products.